A few weeks back, Tim Vanderpyl wrote a post about strategic planning on LeaderLab. It generated some great debate about the usefulness of strategic planning. I took the opportunity to participate in the conversation and that response can be found below (as well as at LeaderLab). I’m a bit late to the party, but I wanted to take the opportunity to add to the conversation. In short, I would have to say that I agree and there is absolutely truth in the theory. I think we could agree though, when strategic planning is done right (development process, implementation, and execution) then there is great potential. Strategic planning is not easy and has challenges, but the hurdles are worth overcoming. Strategic planning is necessary, but only successful when linking the long-term strategic priorities to today’s actions. The plan must be cascaded properly from top to bottom of the organization so that front line staff knows how their work impacts the organization’s goals. Assigning metrics and systematically measuring them fosters accountability. Others in our company would also say that it holds a team “able” instead of just accountable. 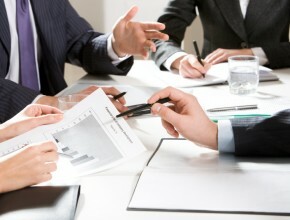 At OnStrategy.com we offer the strategic planning tools to assist with this undertaking. 1) Leadership challenge with strategic planning: “Many people regard execution as detail work that’s beneath the dignity of a business leader. That’s wrong…it’s a leader’s most important job.” – Larry Bossidy, former CEO, Honeywell, Inc.